A base of operations and a home away from home. Shortly after the Allers began coming to the Barillas area, they realized that the fledgling organization would need a place for people to stay if they were to attract visitors to work with villagers. David and Helen Eckstrom were missionaries that had a dorm-like facility called “The Mission House” in town. The Eckstroms wanted to move to Huehuetenango to continue their translation of the Bible to the local language. The Allers were good friends of the Eckstroms, so they worked out a purchase price, and Hands For Peacemaking Foundation had its first facility in Barillas. Several years went by and the termites had their way with the wood dorm portion of the second floor. Fortunately, Rotary clubs from Snohomish County, Washington took on the challenge of raising the money for the remodel, and tearing off the second floor. A team of Rotarians came to Barillas and removed the upper floor, and then took responsibility for the remodel. Instead of simply replacing the dorm portion of the building, the Rotarians added a second floor, and remodeled the downstairs. Since that time, they have added a carport, and have made many improvements to the building. 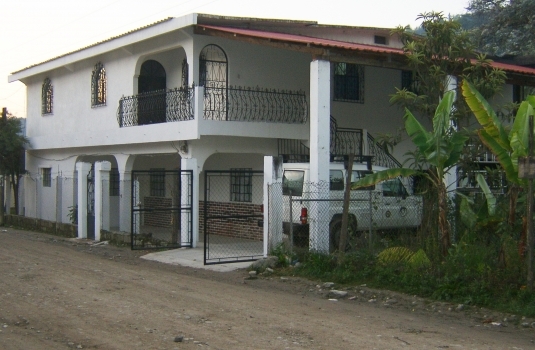 Today, the Mission House houses up to 16 guests at one time, and provides work teams with a comfortable place to stay while they are in the Barillas area.